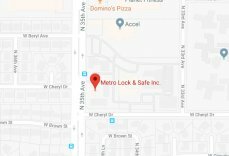 Finding A Locksmith You Can Trust | Metro Lock & Safe Inc.
Posted on July 6th, 2014 by Metro Lock & Safe Inc.
Finding a locksmith in Phoenix can be a complicated and confusing process, especially if you are unfamiliar with everything that goes into it. However, if you find yourself locked out of your home, office, or vehicle, a locksmith is your best bet to get the situation back into your control. There is nothing worse than being locked out and stranded when you want to get on with your responsibilities. For that reason, you should already have the phone number of a locksmith that you trust saved into your phone or in another place that is handy. If not, you need to remember a few things before hiring just anyone to help you out. Locksmithing is one of the professions that sees the most scam artists. Before hiring just anyone, you want to make sure they are a legitimate company. Whoever you call should answer with a business name, not just “locksmith.” Also, get a spoken and written estimate before any work is done. The locksmith should also show up in a company vehicle that is clearly marked so you can be sure they are a proper business and not a scam artist in a recreational vehicle. Even legitimate businesses will sometimes play dirty. Make sure you always ask about pricing before any work is done. Don’t pay until the job is completed as well. You don’t want to be hit with any hidden fees that will set you back more money than you expected. Keep in mind that most locksmiths will have extra charges for emergency hours. This happens when you are locked out late at night or in the early morning hours. You should always get estimates before agreeing to any work, and make sure you understand the entire process the locksmith is going through so you can never be surprised by the cost. Rather than wait until you are in need of a locksmith, you should have one ready that you already know and trust. This will limit any problems from happening when you do need a locksmith. Call around to find a business in your area, then ask about licensing, pricing, and anything else you can think of. Make sure you communicate well with the business, so there won’t be any problems later on.